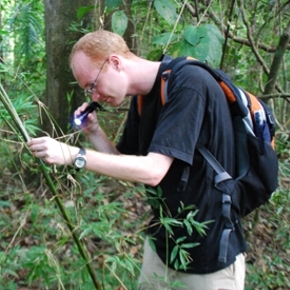 - Biologist Thomas Hesselberg shares some of his experiences of being an AuthorAID mentor and what he has gained from mentoring researchers in Africa and Asia. Interview by Andy Nobes. What is your background and research? My research has always been in the fields of invertebrate biology; more laboratory-based and mainly on spiders in recent years. However, it's now slightly moving into more ecology-type based research. My interest is whole organism biology, so not so much biochemistry and molecular biology, but traditional, old fashioned biology. I also do quite a bit of biomimetics – the idea of taking ideas from nature into engineering; i.e., what can we learn from nature? I did my PhD in mechanical engineering specializing in biomimetics at the University of Bath. My current research is looking at how spiders build webs as well as the mechanical side of silk and webs. What I did in my PhD was looking at rag worms – the worms that live in the mud. The idea was to build a self-moving endoscope. So, we wanted to look at animals that move around in slimy environments similar to the human interior of the human intestines. I was looking at worms crawling in the mud - how they move – the sort of functional things, and then we had some other teams feeding that information in to trying to build robots that can act as an endoscope. Why did you register to be an AuthorAID mentor? I signed up at the end of 2011/12 when I finished a full-time research position. I was working at the University of Oxford in the Zoology department on a Marie Curie fellowship for two years. Then at the end of that, having a wife that was studying here as well I thought, okay I'm getting a bit tired of moving every two or three years, so let's just try and stay in Oxford and the surroundings. I then moved more into teaching and administration and away from active research and I wanted to stay in touch with current research so [AuthorAID] sounded like a way of still being involved. In the end, I did manage to stay involved in research through other collaborations and student projects as well, but still enjoy the very varied kinds of research I get exposed to via AuthorAID. Have you mentored researchers in a similar field? What I've been doing for AuthorAID has mainly been ecology-based, although I sometimes get requests from mentees that are in areas quite far away from my field. I helped one guy who was writing a publication in more molecular type biology. It did have something to do with insects so it was a bit related to what I'm doing. I helped as much as I could but it was more with the English and getting that right rather than the science. I do prefer, obviously, having a close as possible match with my own research interests, but there's not that many people working on spiders! I’ve also been working in collaboration with a Bangladeshi researcher which has been going on for quite a long time now. He is interested in butterfly ecology – It's not spiders, but it's much closer to the area that I'm working on, so he and I will probably stay in contact for quite a long time. He is a Master’s student looking to undertake a PhD in the developed world, so I have read through his personal statements and try to advise him on where he should apply and where he can get funding and that kind of stuff. Also, I've helped him quite a lot with getting his research ready for publication. We have just submitted a manuscript where I am a co-author. I had given quite a lot of input in terms of ideas and data analysis, so on this occasion it's appropriate to be co-author [Editor’s note: AuthorAID mentors are not usually involved to the extent of being co-authors but in some cases the relationship evolves into a collaboration]. I'm just doing one right now which is interesting and completely different – it's on African wildlife. My mentee is writing a paper on wildlife policy to do with legal actions on wildlife crimes. Now I wouldn't say I'm an expert in that at all (which I obviously told him), but I have helped to correct few things. His research is in Tanzania so it's quite interesting to learn some of what is happening there in terms of prosecuting wildlife crimes. It's surprisingly interesting for me considering how very far it is removed from my own line of research. The most successful mentoring experience so far is with the researcher from Bangladesh because I really feel that I've got to know him quite well. He tells me whenever something good happens like 'I've won this award' etc., so that is nice. Helping to get papers published is one aspect of mentoring of course and is what I've had most success trying to help people with. I do get quite a lot of requests for helping with grants development and I'm very happy to do that as well. It is more satisfying to have a longer-term relationships, but I don't think that will always work; it depends on the personalities as well and what they are looking for. What have you enjoyed the most about mentoring? What have you got out of it? Did you learn anything along the way? The main thing I've got out of mentoring is getting exposure to different types of research, which I find interesting, and the long-term relationships. I certainly learned a lot about research in Bangladesh, which is interesting. It's such a huge country which you don't hear much about. It has amazing biodiversity there as well. They do seem to be doing a lot of interesting research at my mentee’s university, but they seem to have very few publications in English and tend to publish in local journals with less visibility to the international community. [For more information about how INASP is helping improve the visibility of locally published research in Bangladesh, see the BanglaJOL platform]. What challenges have you noticed that mentees face? One of the things that comes across is that the main barrier for these people is not so much the research itself – okay, there are some research methods which could be improved – but it's mainly language barriers. I mean, if you don't write English well it’s very difficult for a reviewer to understand what you are actually doing. I am an active reviewer for journals as well and it is very difficult if you get a paper and you really struggle to understand it. You try to look beyond the English but in the end, it does colour the way you are going to review the paper. What is your advice for early-career researchers who are looking to publish their research? I think one of the top tips is to get as many people as possible involved, send your work out to people. Try to get critical feedback. Don’t just rely on one person. I really think AuthorAID is a good way of achieving this. Also, you need to clearly define expectations, and make sure there are clear guidelines of what is being done. Would you recommend mentoring to your colleagues? I certainly would. It’s particularly useful for people in similar situations to me that don’t have their own research groups. I don’t regularly mentor postgraduates – I supervise undergraduate projects at both the college and at Oxford, but I don’t have many opportunities to supervise postgraduates and postdocs, so AuthorAID provides a good way to develop my own mentoring skills and get experience in mentoring more experienced researchers. I have mentioned this in job applications and job interviews. When I’ve been asked how much experience I have in supervising, I often mention that I have experience of mentoring via AuthorAID. It's something that you can use career-wise. It’s also useful to know just how you actually review a paper. I think that’s a useful skill and it's something you should be able to use on your CV. Of course, it's also good if you have some collaborative long-term mentoring relationships. It’s an indication of you collaborating internationally. In general I think that this kind of mentoring is particularly useful for postdocs and early-career researchers who are trying to build up their independent research – mentoring can benefit their own development and future career. To find out more about becoming a mentor like Thomas, visit the AuthorAID mentoring pages.